In Toronto’s outer suburbs food insecurity hurts entire neighbourhoods. To respond to this need, Daily Bread Food Bank has designated 20 priority neighbourhoods that are underserved and has committed to increasing the amount of food delivered to agencies serving these areas by 20 percent over the next year. 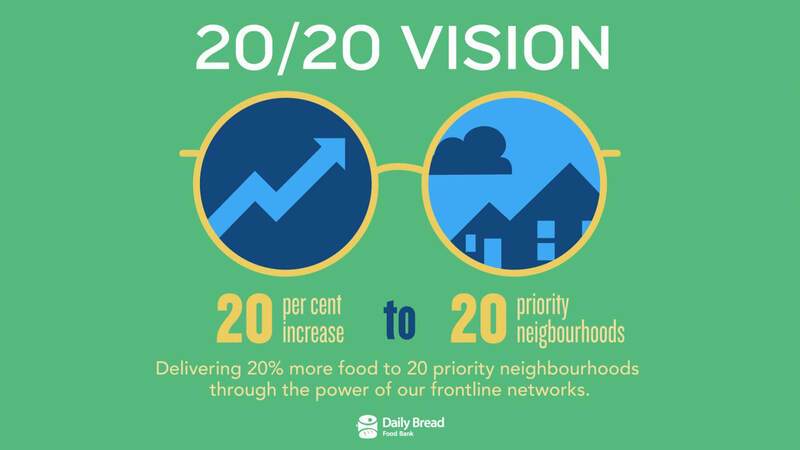 With our network of front-line agencies and food banks across the city, Daily Bread is uniquely positioned to help these 20 neighbourhoods address the immediate needs of their most vulnerable residents by increasing our food shipments to them by 20 percent. Special thanks to Walmart Canada and the Walmart Foundation for their generous support. How did we decide which areas were priority areas? Based on the most recent census, we looked at areas across Toronto where the low income population as % of total population was the highest. We discounted areas in North York which is served by another organization, and areas in central Toronto from this list. We then looked at the largest community food bank members that serve those areas. With this data, our team of researchers and analysts determined the best areas to focus on. What other factors went into determining priority areas? As poverty increasingly moves towards the outer boundaries of Toronto, those living with low income are under-served in terms of social supports, including food. Additionally, there are areas in Toronto that are considered ‘food deserts’ where there are few options for groceries and/or fresh food. Often, the distance between food programs and other social services is also prohibitive for residents, requiring transportation to and from any source of food. Why is central Toronto not included? We know through our work in the community that central Toronto has an abundance of social services and resources as this infrastructure has developed over decades. The traditionally affluent suburbs have not built this social support infrastructure. Which areas were identified as a priority? Will this list ever change? Based on yearly needs assessments, the high priority neighbourhoods may shift as this program continues to expand and populations in the city change. What is the mobile produce market? As one part of the 20 percent target, Daily Bread Food Bank will be bringing farm-fresh produce directly to selected Toronto Community Housing Corporation buildings in Scarborough through Daily Bread’s mobile produce markets pilot project. Until the end of September, Daily Bread’s mobile market is offering residents a fresh, varied assortment of fruits and vegetables, most directly from Ontario farms and farmers themselves. Through this pilot project produce will be distributed to residents for free, providing a barrier-free way for TCHC residents to access fresh, healthy produce at their front door, and give greater access to seniors and people with mobility issues.